It's freaky because it requires so few ingredients, and because it sounds kind of gross until you eat it and realize IT IS NOT GROSS. AT ALL. In a cast iron pan, heat the oil, add tofu cubes, and cook until browned. 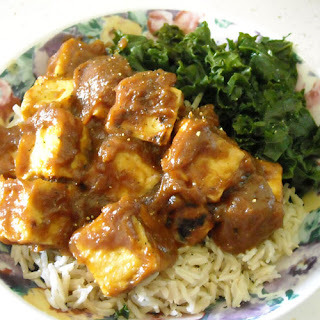 In a medium saucepan (large enough to hold both the sauce and eventually the tofu cubes as well), combine peanut butter and barbeque sauce. When the tofu is almost done browning, put the pot with the sauce ingredients over medium-low heat and stir with a whisk until smooth and evenly heated (this will only take a couple of minutes). Add the browned tofu to the pan with the sauce and toss to coat. * If you're going to cook brown rice and greens to serve with the tofu, like I did, a quick tip for minimizing your dishes is to just add the chopped greens on top of your cooking rice for the last 10-15 minutes of cooking. The steam will cook them and then you can either serve them separately or toss them in with the rice before serving. If you serve them on the side, they are good with a squeeze of lemon juice and some salt and pepper. Sounds(and looks) good to me!